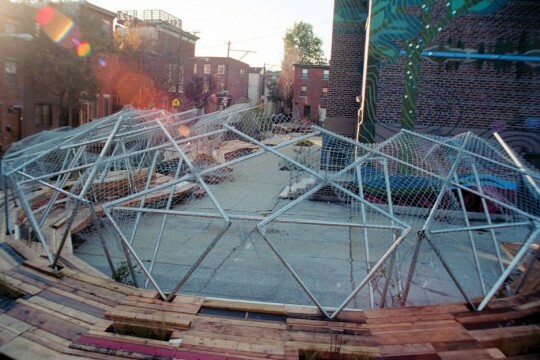 International Design Clinic, an independent nonprofit organization dedicated to realizing much-needed creative work with communities around the world, conceived of chainlinkGREEN in response to the often lacking community spaces for underfunded schools and community organizations. ChainlinkGREEN is a construction system that uses materials commonly found on abandoned lots, including chainlink fencing, steel pipes, standard 90 degree angles, reclaimed lumber, and rubble, to create a lightweight and easily constructed structure that serves as an outdoor amphitheater/gathering space for the community. It demonstrates that affordable, accessible, inviting spaces may be created within previously overlooked landscapes.